Backpacking in the Maghreb: going to Morocco! Movin’ on Up: C’mon lucky 11! My trip through Morocco has been terrific so far, with many serendipitous encounters and lots (and lots, and lots) of interesting, friendly new people. Last night at my Fez guest house, Pension Dar Bou Inania, I met an American woman who’s also traveling solo. Melissa joined myself and some other Canucks for breakfast at Cafe Clock (my home-away-from-home in Fez), and asked me over pancakes and fresh-squeezed orange juice if I’d be interested in joining her at the Hammam this afternoon. I’d tried to get to a hammam with some other travel friends in Meknes, but had missed the appointment, so I was happy to find a companion for our first time in a communal Moroccan bathhouse. Going to a hammam is one of those cultural experiences that I really wanted, but was a little trepidatious about because (especially as a Canadian), I don’t want to step on any toes, do anything wrong, or offend anyone. It seemed like a room full of naked women just trying to go about their business is a prime place for a dumb tourist gaffe. But pretty much everyone in Morocco has been very kind, especially the women, and I was determined to do it. But it certainly helped to have Melissa there, also on her first hammam trip, to share the experience. There’s no sign on the door, and both of our guidebooks gave only rough directions, so we wandered the streets, towels in hand, until some guys pointed us to the right door. Joining a handful of other women in the hallway, we waited for the men to leave (hammams generally have separate times for men and women), before shuffling into a changeroom. There we took off our clothes – everything but our underwear – and were directed to give our clothes to the attendant and sit opposite her booth. We waited, somewhat nervously tho not very self-consciously, as all around us Moroccan women stripped down and proceeded into the rooms of the Hammam Sidi Azouz. Eventually an older woman motioned for us to follow her, and taking our bathing supplies, we did. The bathing rooms are warm, tile-lined, and seem ancient; a great dome above us pierced with holes, and a few bare bulbs hung down to assist the sunlight. The occasional shaft of light would shine clear across the dome, through the steam. She gestured for us to sit on the floor, and proceeded to bring buckets of hot water to set around us. Then she washed my hair, using a scrubber to really get in there and the shampoo I’d brought (there’s often some henna for sale at the hammams, if you forget). Giving me a quick rinse, she moved on to Melissa. 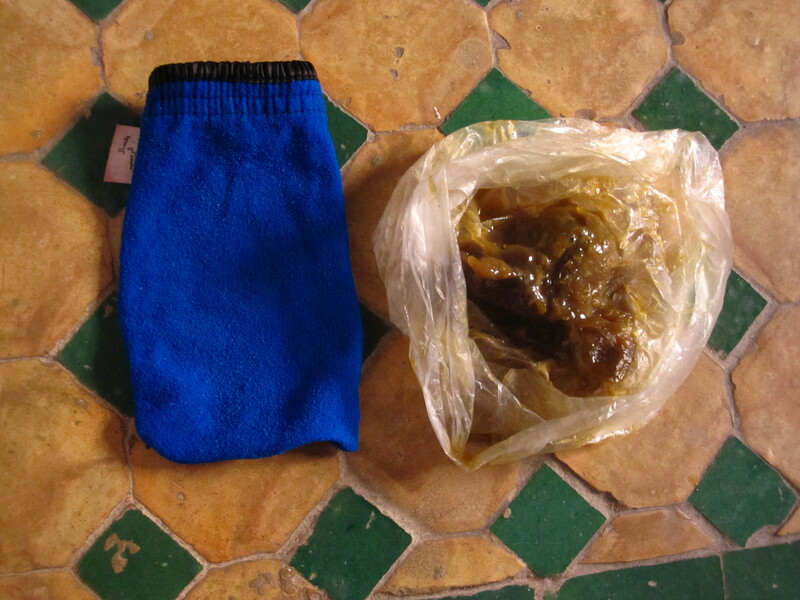 Then we were joined by another lady, who soaped us each up and scrubbed down our arms, legs, torsos, and faces with our scrubbing mitts and sabon bildi (a slimy argan or olive oil -based soap, purchased earlier in the souks). Dead skin sloughed off as she scrubbed us each down in turn, rinsing us off with a bucket of wonderful hot water. Then the massage; I laid down on the floor, face first, as she use the sabon baldi to work out the kinks in my back and then my front. On the one hand, it’s a bit weird to be half-naked in a room full of half-naked women while yet another half-naked woman massages you; a very non-North American experience. On the other, it was sort-of like being a little kid again, and having something else wash you; you feel very much taken care of, and she was very good. Another big rinse down in another room and we were done, both of us glowing and feeling extremely relaxed and lovely. Given how filthy you can feel when travelling, and how iffy the showers in a lot of places are, it is the most amazing feeling to be so clean. I don’t think even the best hot shower at home can compare; certainly I’ve never had a massage that was so expert and so matter-of-fact. For 100 dirhams (about $12 CAD), it’s worthwhile enough that I’m sure I’ll go many more times before I leave Morocco; it’s a wonderful experience at any price. To anyone who’s feeling a bit nervous about it, I have to say that it’s worth the plunge. if you’d like to read a bit about my time in Morocco and dream of your own trip to this beautiful country, check out my posts from ‘way back then – Backpacking in the Maghreb, Solo in Morocco, and try my recipe for Preserved Lemons! Hello Candace. I am also a Canadian who happens to live in Taroudant in southern Morocco. I’m lucky to have a good Moroccan friend who goes with me to my neighbourhood hammam and gives me a good scrubbing for free. If ever I go alone, there are sometimes men there who are more than willing to do the job for a few dirhams. If I tell anyone here that you paid 100dh in Fez for much the same treatment, they would be incredulous. Are you able to give me the rough address of the Hammam in Fez? I’ll be traveling there for 3 days from Spain and would love to go. I have read your long interesting feedback of visiting Morocco on LP. Truly it is a good experience that marked many things on your mind. I am hammhal by nickname on LP website. Being a Moroccan, I ask you forgiveness in the name of all honest Moroccans who feel bad to hear that tourists are still ripped off in Morocco. Hassles and ripping off always happen in touristic cities like Fes and Marrakech and of course with the ignorance of the local language and the bargaining process things like that would occur. Actually, this would not have happened to you if you were accompanied with a local Moroccan. Thus, you would have saved more than fifty percent of your budget and visited other places that tourists did not visit. I would like you to accept me as a travel partner next time you visit Morocco. As I work full time I think I need a vacation to change air. I do have a car and we could share the expense and adventure together. with a local Moroccan you can explore Morocco from very close and you would not have the language barrier. In order to show you my trust, I can mail you some of the scrubby mitts for your skin and the ceramic scrubby for your feet. They are not pricy. I hope to hear from you back. – Price – yes, we were overcharged. I knew that we were at the time, and decided that $12 CAD is such a small amount of money – at home, not even enough for a meal or a movie ticket – that I wasn’t going to argue. Comparatively, those of us who live in the West are rich, and it seems miserly to pinch every dirham. I got to show off my haggling skills in the souks, and I did very well there. – Location – I’m afraid I could walk you there, but I couldn’t give you directions. There are two in the Fez medina, on each of the ‘main’ roads; I’m sure if you ask at your Riad/hotel, they’ll direct you. Don’t worry – I don’t judge all of Morocco by a few encounters! I met so many wonderful, friendly, hospitable people – I’d never give anyone the impression that I got ripped off a lot in that beautiful country. I’m sure if I knew more Arabic, I wouldn’t have had any trouble at all! Thanks so much for your offer – I’ll keep it in mind next time I visit Morocco – it won’t be for a while, but I do hope to go back, as I really did love the country and had a fantastic time there. And I may just take you up on that last offer – I can’t find the same items here! I have just read your “feedback” from your trip to morocco, and found it to be one of the most informative articles on Morocco I have ever read. I live in the US (Arizona) and I’m planning a trip to Morocco September/October 2013 for my birthday. I’m bringing my best friend Annie, but I don’t know if I’m as adventurous as you are. I’ve tried to find a tour that goes to Marrakesh, Essasouira, Quarzazate,and maybe Fez if time allows, but I can’t find one. We love to sightsee, shop, have fun and talk to people. Have any suggestions? Moha- please email me at your convenience. You sound like a great travel companion and Annie and I love to make new friends. Candace, thanks for the article. Regards and happy future traveling. Thank you! I had so many questions before I went to Morocco, and it was hard tracking down informed answers, so I really wanted to provide something to help people who were thinking about travelling there. I definitely suggest going on your own, not with a tour, and using trains to get from place to place – Grand Taxis are pretty good too, especially if you have more than one person to split the cost with! You’ll do fine with just the two of you, I’m sure. I’m the worst for misunderstanding train schedules here at home, yet I didn’t have any problem with Moroccan trains. I really, really recommend Meknes – it’s a lovely city, and the Medina is small and manageable but still a great place to shop; aside from that, it’s a relaxed place that isn’t quite so touristy, so you can get used to haggling/etc. And the food! Everywhere I ate in Meknes was great, while I have to say I didn’t have a single really good meal in Marrakech (tho I really loved pretty much everything else about Marrakech). I definitely also recommend Fez; it’s not as hard to navigate as people say it is, and if you do get lost, you can always ask for directions (ask a woman!). In Fex there’s a great place in the Medina called Cafe Clock, which has lots of neat things like dance classes and live music, as well as great food – I found I met lots of people there, or in the neighbourhood around there. When you’ve been, I’d love to hear about your trip – honestly, of all the places I’ve travelled, Morocco captured my heart. Thank you so much for all the information you Morocco. My friend and I are planning a trip to Morocco for this November. All this information definitely helps. I see you have a friend Moha over there. Is it possible for me to contact your friend? It would be great to have a local travel companion. Thank you again for all the information. I went there yesterday and the scrub woman tried to scam me. I confirmed the 15 dh price multiple times with an English-speaking Moroccan woman before I agreed to the service (and certainly wouldn’t have done it had I known the woman would try to scam me). Then, at the end of a short scrub, the woman kept making the money sign to me. She made it clear she wanted me to bring her the money directly, not to the staff in the locker room. Then, when I brought the 15 dh, she very dishonestly pretended that she had said 100 dh. When I started to walk away to talk to the other staff, she (Malila) quickly changed her mind and went with the original price (discreetly since the whole thing was obviously under the table). It was really a sour end to a good experience to have her so blatantly attempt to cheat me/lie. To all other travelers: Do not fall for the 100 dh scam here! A short scrub should be about 15dh. If someone tries to scam or mistreat you in Morocco, tell them “Haram aleik” (“Shame on you!”). The scamming is so bad in Fes that you can hardly get directions without people trying to make you pay for it. They will follow you even if you tell them not to and almost anyone who talks to you in the street is doing so because they expect money. It is terribly, terribly sad because it means that you can’t trust anyone or accept hospitality of any kind in the good faith that it is genuine. The directions thing is particularly bad and even potentially dangerous because people will lead you away from where you want to go if you don’t pay them or take their services. Always brings a map and ask people who are providing food/services to local clients. I understand your frustration, but I think you’re mistaking the hustle of people living in poverty for a scam. One of the things that became abundantly clear to me when I was Morocco was that I, Lower-class Canadian arts worker that I was, living below the Canadian poverty line at home, was rich – really rich – in comparison to most of the people in Morocco. So while i know that the prices I was being charged for things was more than a local would be charged, I also know that the 200 dirhams that I spent on my hammam visit was approximately $20 here at home – a fraction of what you’d be charged for a similar experience in Canada. I know, and they know, that I can afford it. In fact, while I did haggle and bargain in the souks, and felt like I got good deals on what I bought overall, I know I paid more than a non-tourist would. I don’t have a problem with that, and I don’t see it as a scam. I see it as the hustle of someone who knows that their next meal – and maybe their whole familu’s next meal – depends on getting as much cash out of this rich foreigner as they can. I completely sympathize with them. And I’m afraid that I can’t share you outrage or upset. Chances are that if you can afford to travel to Africa, you can afford to get overcharged here and there. And I’d suggest that if you don’t want to get asked for a tip when someone helps you, ask a woman. I’d suggest that you ask women anyway, especially the older ladies, because even if they don’t speak English, they’re often very cool about making sure that you get where you want to go. But also, try travelling to another country with an ye to what their experience is, and remember that poverty is very different in different countries, and don’t judge them the way you might judge similar behaviour back home. Though really, if you bring the same attitude to the poor at home, you may want to examine why that’s so. We are going to Morocco in April, first to Rabat and thinking afterwards Fez. And i would appreciate if you could share my email address with Mocha who seems really lovely as we want to experience local life as much as possible. I’m going to this hammam tomorrow, it will be my first time too! Awesome!! Please tell me all about it! !